North Korea says a peace treaty between the two Koreas should not be used as a bargaining chip towards denuclearization. North Korea will not hope for an end-of-war declaration if the United States does not want it, adding that the issue should not be used as a “bargaining chip” in denuclearization talks, the country’s state media said Tuesday. “Now that the DPRK and the US are aspiring after the establishment of new relations true to the spirit of the June 12 DPRK-US joint statement, it is quite right to put an end to the belligerent relations between them,” the Korean Central News Agency said in an English commentary. “But, if the US doesn’t want the end of war, the DPRK will also not particularly hope for it,” it added, using the acronym of North Korea’s official name, the Democratic People’s Republic of Korea. The KCNA said that formally ending the 1950-53 Korean War will meet the “interests” of all countries hoping for peace on the Korea Peninsula. It added such a declaration should not be used as either a “gift” or a “bargaining chip” in the denuclearization talks. 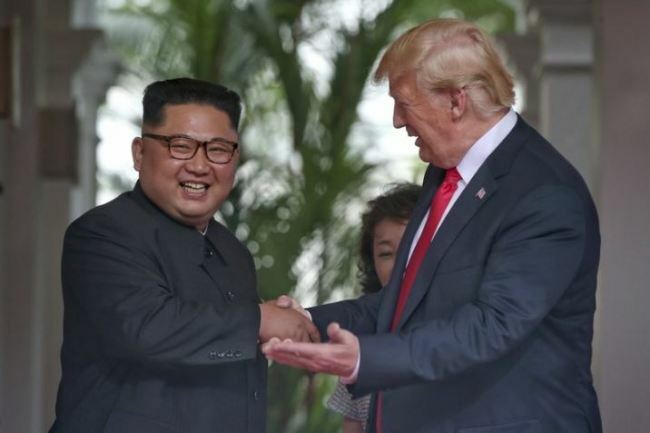 US President Donald Trump and North Korean leader Kim Jong-un held their historic summit in Singapore in June in which they agreed to work toward complete denuclearization of the Korean Peninsula. Their denuclearization talks, however, have been almost stalled ever since as the two sides apparently remain at odds over the end-of-war declaration issue. North Korea has called on the US to actively engage in talks on declaring an end to the Korean War, which was halted in 1953 with an armistice, not a peace treaty. The US has said that it will not make such concessions unless the North takes substantive steps in ridding itself of nuclear weapons. In a summit in April, the leaders of South and North Korea agreed to cooperate in declaring an end to the war this year, saying that they will seek multilateral talks involving the US and possibly China. North Korea recently asked for “corresponding” reciprocal measures for the possible dismantlement of its important Yongbyon nuclear complex, a demand experts say might refer to declaring an end to the war or easing sanctions imposed on its regime. The KCNA said North Korea has taken “substantial and crucial steps” to implement the summit agreement with the US but that Washington is still talking about intensifying sanctions, rather than trying to resolve the end-of-war declaration issue that should have been resolved decades ago. “Some Korean issue experts of America are recently spouting such rubbish that the US should force the DPRK to not only notify its nuclear program and have it verified but also dismantle its Nyongbyon (Yongbyon) nuclear facility and missile facility in return for the US response to its call for a war-end declaration,” it said. “The issue of the war-end declaration should have been resolved half a century ago, under an armistice agreement. It is also the most basic and primary process for the establishment of new DPRK-US relations and peace mechanism on the Korean peninsula, to which the US was also committed,” the KCNA added.